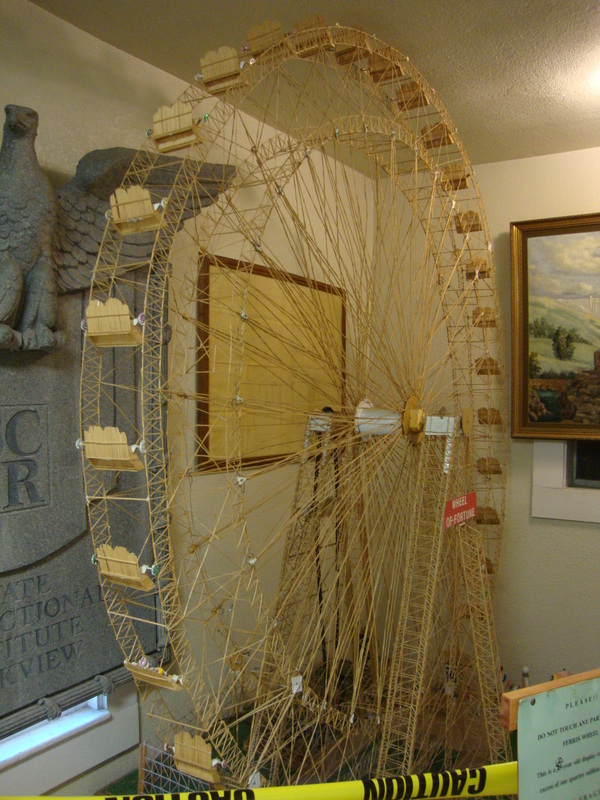 In the 1930s, Folsom inmate, Billy Burke constructed an 8 foot high Ferris wheel using over 250,000 toothpicks. The process took Burke 10 months to complete. It even turned by an electric motor. This remarkable creation is on display at the Folsom Prison Museum and is extremely fragile. It sure beats my rubber band ball I’ve got going. This Ferris wheel is only the first of many toothpick creations by Burke. You can learn more about Burke HERE. I can imagine living in a tiny cell day in day out, can induce plenty of ennui. The days of doing what you want are over the second you become a resident behind bars. When I visited the prison, one guard told me that many of the inmates are avid readers, while others fill their time shooting hoops. If they’re able, they’ll find themselves stamping out license plates—all of which can still get old. (And forget about a cigarette break—prisoners and guards are not allowed to smoke inside the prison grounds). They can, however, have a 13″ television in their cell with 8 channels, only a few of which being “prison channels” featuring G-rated programming. Somehow, I doubt children’s television and movies rank high on their list of things to watch. I imagine toothpicks are not allowed in the prison anymore, but I’ll bet a sugar cube castle would be alright. Then again, 3000+ inmates on a sugar high is usually not a good thing. Categories: Folsom History | Tags: boredom, Folsom Prison Museum, toothpick Ferris wheel, toothpicks | Permalink. I think we could make the same thing with 249,000 toothpicks. Whadya think? Should we give it a try? Ha! Maybe 249,999. I think a sugar cube castle will still be easier. Tastier, too. Now I feel like I should carry a box of toothpicks and a bottle of glue everywhere…doctor’s office, stuck in traffic. Eiffel Tower, anyone? Let’s call Cynthia–I’ll bet she’ll be up for it! This ferris wheel was built by my Dad. It’s not the only one he built though. During his lifetime he built many toothpick carnivals. You can check them out at http://www.toothpickcarnival.com. That’s incredible–thank you for letting me know. So it all started at Folsom, huh? I was lucky enough to have the opportunity to see it when I visited the prison museum last year. The structures he buil are amazing. What got him started in doing them? Yes, it all started at Folsom. He was bored and needed something to fill his time and he always liked to work with his hands. One of the miniatures he built is still on display at Musee Mechanique in San Francisco today. You can see pictures and video of it on my website http://www.toothpickcarnival.com. I believe there are still other toothpick carnivals out there in a couple places around the country; I just wish I knew where they were. I’m so glad you found my site, John, and let me know about your father. His later toothpick creations are amazing. I added a link to your site on the blog post. Thank you April; that was nice of you to add the link to you post!